Nestled in the foothills of the majestic Himalayas in the state of West Bengal, Chalsa is an incredibly beautiful destination known for its abundant natural beauty. It is located in the Duars region, also called Dooars, which is another popular tourist destination and a gateway to Assam. Filled with thick forests, sprawling verdant valleys, lush tea gardens, rivers and streams, Chalsa is an idyllic holiday destination. The small town of Chalsa is surrounded by forests, which are home to two important wildlife sanctuaries, namely Gorumara National Park and Chapramari Wildlife Sanctuary. These forests are home to exotic wildlife, including a large number of elephants and rhinos. Because of its location, Chalsa can be a base for those looking to explore surrounding offbeat, as well as, popular tourist destinations such as Bindu, Dooars, Jhalong, and Jaldhaka, amongst the others. The hamlet of Chalsa is also known for its weekly market at Mangalbari Haat and is a major stopover for buses plying to other regions in Dooars. The best times to visit Chalsa are post-monsoon and winter months. The weather turns pleasant from September and the temperature starts to drop from October. January is the coldest month when the temperature ranges between 10-1 degree Celsius. A visit to Chalsa can, therefore, be enjoyed between September and March. By Road: Chalsa is located about 60 km from Siliguri, a major city in the northern part of West Bengal. The best starting point if you wish to travel to Chalsa by road, therefore, is via Siliguri. A number of buses and taxis are available, additionally, self-drive is another option for those who enjoy driving through beautiful vistas. By Air: The Bagdogra Airport, located in the Siliguri is about 2 hours away and approximately 75 km from Chalsa. Bagdogra has regular flights to and from cities like New Delhi, Kolkata, Guwahati, Chennai, etc. One can hail a cab from the airport or board a state transport bus from Siliguri to reach Chalsa. By Rail: As Siliguri is the nearest major city with a good connectivity with other cities and states, travelling by train is also a good option. The NJP or New Jalpaiguri Railway Station is a major station with a good rail connectivity with cities like Kolkata, Delhi, Chennai, Mumbai, etc. The distance between NJP and Chalsa is about 58 km. Primarily known for its huge population of Indian rhinoceros, Gorumara National Park was declared a wildlife sanctuary in the year 1949. 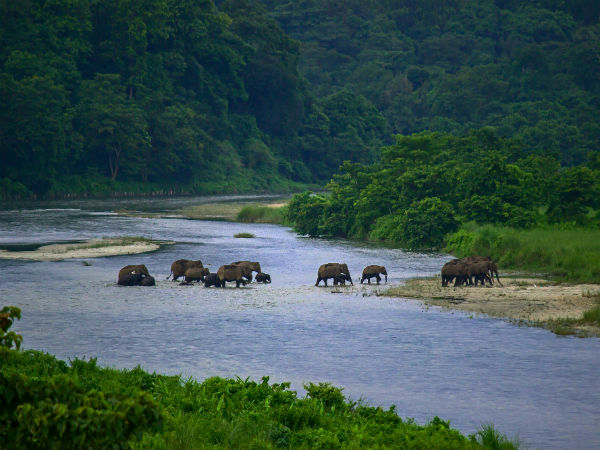 Located in the eastern Himalayas, on the floodplains of Murti and Raidak rivers, the region is blessed with thick forests, rich grasslands, and thriving wildlife. The park is home to several species of resident and migratory birds, along with animals like Asian elephants, sloth bear, deer, Indian pythons, king cobra and the endangered pygmy hogs, amongst the others. Gorumara National Park is located about 14 km from Chalsa. Sitting on the Indo-Bhutan border, the tiny hamlet of Bindu is the last village in the Kalimpong district. It is a picturesque place with serene landscapes and is surrounded by plenty of forests and hills of both Bhutan and India. Jaldhaka river which flows through Bindu and Bindu Dam are popular tourist attractions here. One can visit a number of small villages and tribal settlements around to get a glimpse into the interesting traditions and culture of the habitants of this region. Located about 30 km from Chalsa and Lataguri, Chapramari Wildlife Sanctuary is situated close to the Gorumara National Park. The name Chapramari is derived from "chapra" which is a variety of tiny fish found in the region, and "mari" which means abundance. Home to a wide variety of flora and fauna, the sanctuary is known for its abundant population of elephants along with rhinos, deer, leopards, boars, etc. The picturesque town of Lataguri is located in the Jalpaiguri district, outside the Gorumara National Park. It is an important place as the entry permits for Gorumara National Park and Chapramari Wildlife Sanctuary have to be obtained from here. Jaldhaka, Jalbong, Alipurduar, Murti river and Bindu are some of the scenic places around to explore. Interested ones can go on small hikes around the numerous tea estates and forests.